A best-selling, practical, accessible text from one of the most respected authors in the field, this text features the latest practices, technologies, information research, and challenges related to the implementation of inclusion in today’s schools. 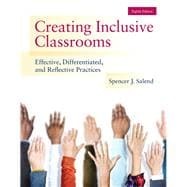 Long respected as a leading text for inclusion courses, the new Eighth Edition of Salend’s Creating Inclusive Classrooms is updated to cover the latest practices, technologies, information, research, and challenges in the field. Designed for both online and face-to-face courses, the new edition includes elementary and secondary level classroom-based videos and examples as well as innovative learning experiences that guide readers in applying and reflecting on the content presented. The themes of diversity; collaboration; technology; and effective, differentiated, universally designed, culturally responsive and reflective classroom practices are woven throughout each chapter, and the book is consistent with professional standards for preparing teachers to work in today’s diverse classrooms. A non-categorical text, Salend sets the standard for translating research into practice and integrating online pedagogical learning activities and chapter self-assessments to allow readers to tailor, extend, and receive feedback on their learning. The Enhanced Pearson eText features embedded video links, interactive exercises and chapter self-assessments, innovative online and differentiated learning experiences. Spencer Salend. A former teacher in the New York City School System, Spencer Salend is a professor at SUNY-New Paltz. Widely known for his work in translating research into practice, he has published and presented on such topics as inclusive educational practices, educational assessment, and students from culturally and linguistically diverse backgrounds. In recognition of the significance of his research and work with schools and its benefits to others, he was selected as a recipient of the State University of New York’s Faculty Scholar Award and the Chancellor’s Research Recognition Award. He has also served as a project director and program evaluator for numerous federal and state projects and has shared his work by engaging in a variety of professional development activities. He serves as an expert consultant helping the American Federation of Teachers (AFT) develop and implement a rigorous and comprehensive performance-based teacher evaluation system and professional learning program that addresses standards for highly effective teachers of students with disabilities in inclusive classrooms.